" ... [Andy] Martin called one federal judge a "crooked, slimy Jew, who has a history of lying and thieving common to members of his race." He also expressed sympathy to the perpetrators of the Holocaust. ... Martin was featured on a Fox News broadcast about Obama in which Martin said Obama's work as a community organizer was 'training for a radical overthrow of the government.' 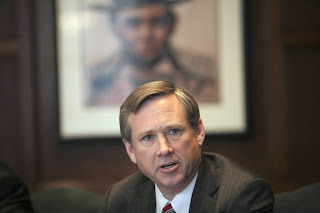 ... "
This time, Martin is going after North Shore U.S. Rep. Mark Kirk, a much better-known candidate seeking the Feb. 2 Republican nomination for the U.S. Senate seat once held by Obama. A Tribune poll in early December showed Kirk far ahead of the rest of his five rivals for the Feb. 2 Senate nomination, with 41 percent support. Martin had 2 percent backing while the combined support for Kirk's opponents was 13 percent. A total of 46 percent of GOP primary voters were undecided. In the radio ad, which aired Monday on WGN-AM and WBBM-AM, Martin attributes a "solid rumor that Kirk is a homosexual" to conservative Republican businessman Jack Roeser. Martin's ad also claims that Raymond True, the chairman of the conservative Republican Assembly of Lake County organization, says Kirk has surrounded himself with homosexuals. The ad says Kirk should address the rumors. Pat Brady, chairman of the Illinois Republican Party, issued a statement disavowing Martin's ad. "His statements today are consistent with his history of bizarre behavior and often times hate-filled speech which has no place in the Illinois Republican Party," Brady said. "Mr. Martin will no longer be recognized as a legitimate Republican candidate by the Illinois Republican Party." True said Monday that he "never made that statement" attributed to him by Martin. True said he appeared recently on a show hosted by Roeser on WIND-AM and "I made a comment not about him (Kirk) at all, but that there were some people on his (Kirk's) staff that had a special orientation." "I never said Mark was a homosexual and there's no evidence to that fact," True said in a telephone interview. On the WIND broadcast, Roeser criticized several Republicans for their support of gay rights and said of Kirk "a solid rumor is that he himself is homosexual," according to a podcast on Roeser's Web site. Roeser was not available for comment. The longtime conservative activist, who has chafed at the leadership of the state Republican Party, has backed several failed GOP candidates in bids for statewide office. Neither Roeser nor True has backed Martin in the GOP Senate primary. For decades, Martin, previously known as Anthony R. Martin-Trigona, has sought a variety of public offices as a Democrat and as a Republican. In Illinois, he received 34 percent of the vote in 2008 in losing a two-man race for the GOP U.S. Senate nomination to the little-known Steve Sauerberg. In 2006, he got less than 1 percent of the vote in a multi-candidate race for the Republican nomination for governor. In federal court filings from the 1980s related to bankruptcy proceedings against him, Martin called one federal judge a "crooked, slimy Jew, who has a history of lying and thieving common to members of his race." He also expressed sympathy to the perpetrators of the Holocaust. In 1999 when Martin ran for president, he aired a TV ad in New Hampshire that said GOP contender George W. Bush "had a cocaine problem" and suffered from "alcohol abuse." Martin gained some attention during last year's presidential contest by contending President Barack Obama was a Muslim and contesting whether Obama was born in Hawaii. Martin was featured on a Fox News broadcast about Obama in which Martin said Obama's work as a community organizer was "training for a radical overthrow of the government." The Washington Post reported that a Fox News official later called Martin's appearance a "mistake" and said the guest had not been vetted properly. Martin graduated from the University of Illinois law school, but the state Supreme Court in 1973 denied him admission to the bar and noted that his Selective Service record showed he had a "moderately severe character defect manifested by well-documented ideation with a paranoid flavor and a grandiose character." The federal courts have repeatedly sanctioned him for what a U.S. district judge termed Martin's filing of "a substantial number of lawsuits of a vexatious, frivolous and scandalous nature." In e-mail commentaries, Martin refers to himself as an "insurgent Internet powerhouse" and a "legendary Chicago muckraker, author, Internet columnist, radio talk show host, broadcaster and media critic." He has filed unsuccessful lawsuits against the Tribune, questioned the integrity of its reporters and said he would not cooperate with the newspaper regarding his Senate candidacy. Martin indicated he would go after rumors about Kirk in e-mails he disseminated during the summer. Those e-mails corresponded with the announcement that Kirk and his wife of eight years, Kimberly Ann Vertolli, had agreed to a divorce. Kirk's former wife attended and endorsed Kirk at his Senate candidacy announcement in July. Kevin Metheny, program director at WGN-AM, said the station had no choice but to air the commercial under federal communications law and Federal Communications Commission rules for political advertising. Metheny said the station "is not allowed to edit or censor a candidate's political advertising, to limit it to a particular time of day, or to reject it as inappropriate." WGN-AM and the Tribune are both owned by Tribune Co.
WBBM-AM said on its Web site that the station is required by the FCC to provide all legally qualified federal candidates with "reasonable access" and to "air political advertisements without censoring them." David Oxenford, an attorney specializing in broadcast law with the Washington-based firm of Davis Wright Tremaine, said stations are very limited in their ability to refuse political advertising based on content from a legally qualified federal candidate. "Unless an ad is legally obscene or violates a felony (statute), a station can't censor it," said Oxenford, who has represented broadcasters for more than 25 years. Oxenford said the federal requirement makes stations immune from civil lawsuits, though candidates have faced lawsuits over making allegations that are false and known to be false in their advertising.